Go to any Italian restaurant in the States and on the appetizer menu you’ll see fried calamari. Today, even sushi bars offer tempura style calamari. They’re irresistible. Sort of like that commercial “bet you can’t eat just one”. What I’ve found so humorous about some people’s addiction to this delightfully crunch encased, meaty, sweet snack is that they have no idea of what they are eating! Ask them and they respond with: “They’re calamari.” “I don’t know. Some Italian fish.” Yes, they’re right. Calamari IS Italian. Italian for squid! Now, don’t go getting all squirmy on us. Admit it. You love fried calamari. Those crunchy little batter fried, golden rings dipped into marinara sauce or a kicky Asian wasabi mayo are awesome! Calamari are everywhere. They keep company with a mélange of seafood in bouillabaisse or cioppino, they’re part of paella. You can grill them or quickly poach them and add them to a salad or antipasto plate. Toss them into a hot pan of good quality extra virgin olive oil, a bit of garlic and a squirt of lemon, and you’ve got the Mediterranean on a plate. Inexpensive and already cleaned for your culinary pleasure, check the frozen food section of your local supermarket or Asian specialty market. Freezing doesn’t seem to hurt them at all. And NO, when cooked they do NOT have the consistency of rubber bands. Well, if improperly cooked they do. Here’s the secret to succulent, perfectly cooked squid. Cook it for just a few seconds. Yeah, that’s right- just a few seconds. Bread it and fry it in hot oil till golden. Serve. End of story. Toss into stews at the last minute before serving – done. If it’s chewy, you’ve cooked it too long. In all honesty, there is a two sided cooking coin here. 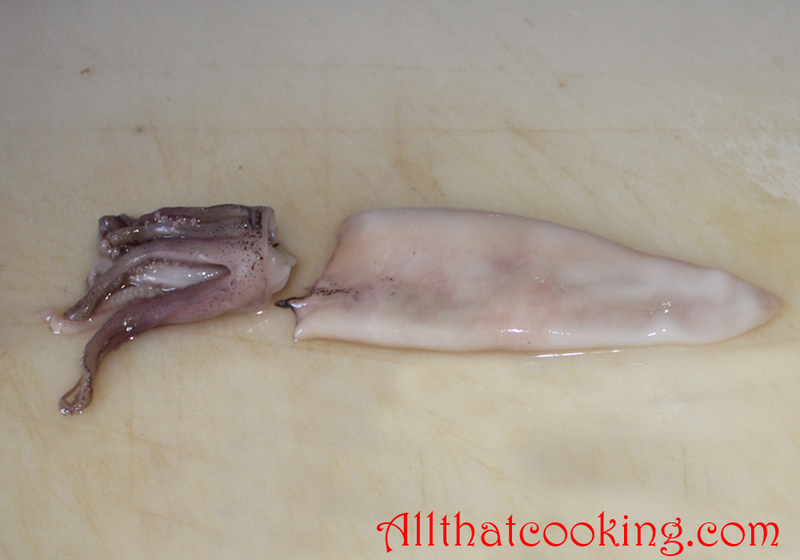 For perfect squid, either cook it very quickly, or cook it forever. I say quick is easy. It’s done when opaque and firm to the touch. Experiment. Squid is inexpensive and you have nothing to lose. 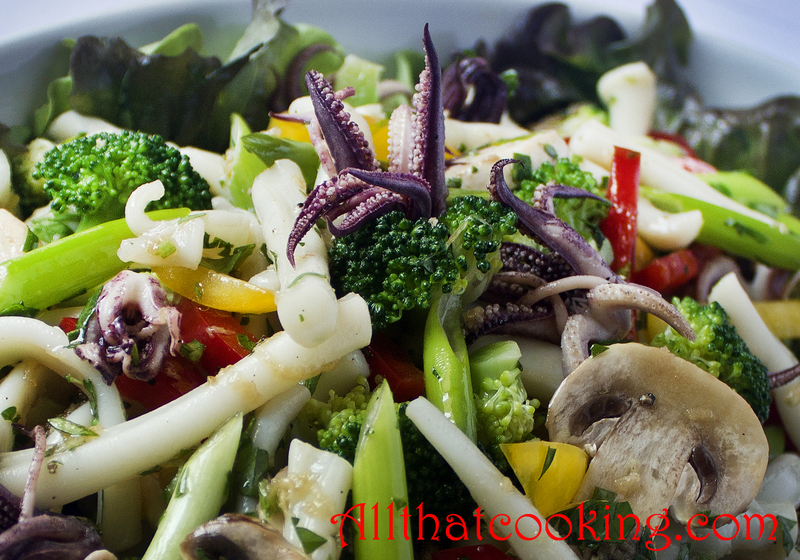 To get you started here’s Oli’s easy recipe for calamari salad along with a simple Asian dressing. For a different presentation, Oli doesn’t cut the squid into rings, he just slices the tubes length wise into strips. My life philosophy is this: “It’s all about the journey”. Go ahead. Try something new. You never know where the journey will take you. . .
Oli purchased fresh squid and cleaned it himself. We’re not going to go through the step by step cleaning process, because you will readily find cleaned squid in the States. However, here are a couple of before and after pictures. 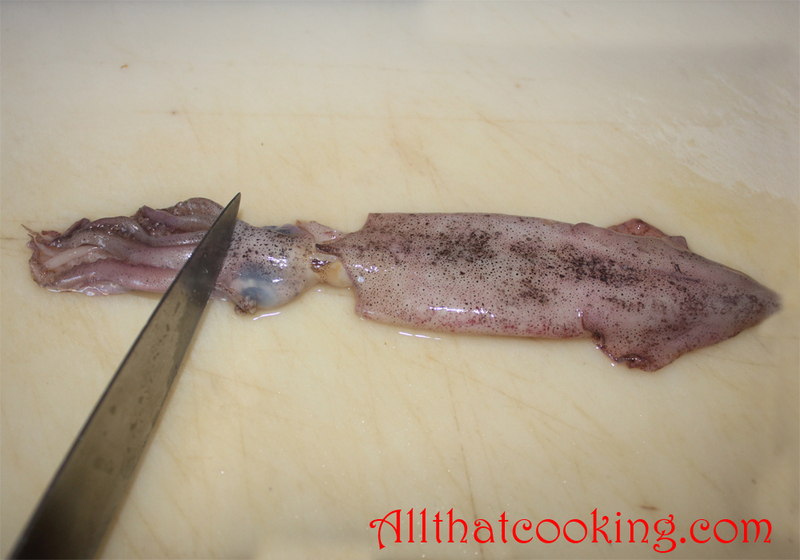 If you are interested, we do have some detailed pictures of how to clean a squid. The first picture shows an entire squid before cleaning. The second shows it cleaned: tentacles and tube ready for cooking. This recipe is a starter for 4 people or a main course for 2. 1. Combine garlic, ginger, olive oil, sesame oil, lime juice, soy sauce, pepper and fish sauce in a medium bowl and whisk until blended. Check for salt, you may not need to add any. Reserve until ready to use. Medium bowl filled with ice water 1. Bring a large pot of salted water to a boil over high heat. Toss in the broccoli and cook for about a minute and a half. 2. Use a slotted spoon or sieve to transfer the broccoli into the ice water bath for just a few seconds. Remove the broccoli and keep the ice water. Use paper towels to dry the bright green florets then put them into a large bowl. 3. Bring that large pot of water back to a boil and throw in the squid. Cook the squid for 30 seconds (40 seconds at the most). 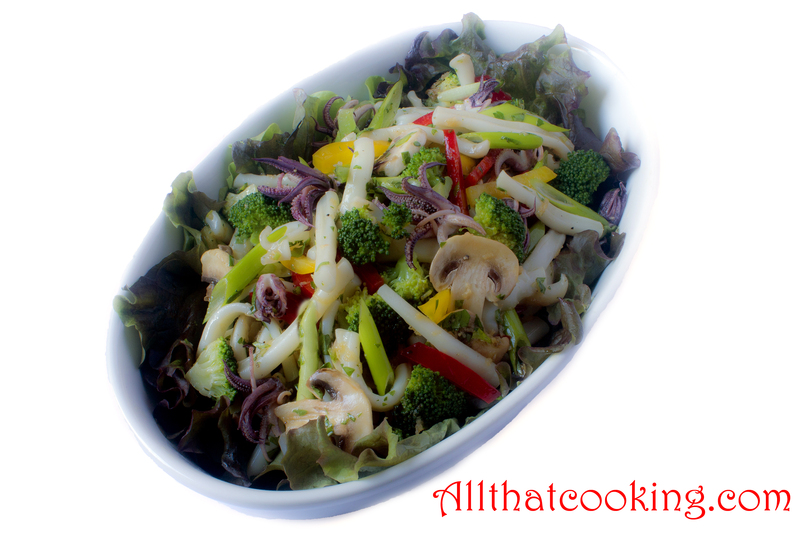 Scoop out the squid and place it in the cold water bowl to cool, then drain, pat dry, slice into strips and add to the broccoli. 4. 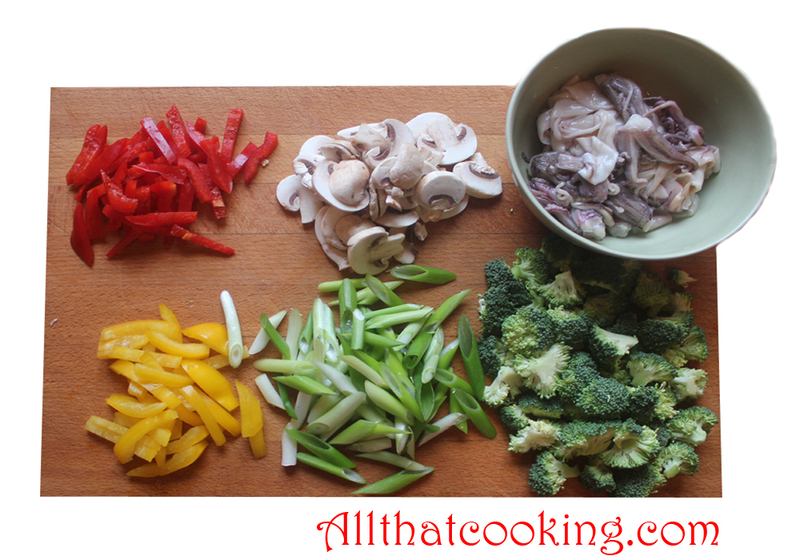 Add scallions, mushrooms, bell peppers and parsley to the broccoli and squid. 5. Give the dressing a quick whisk or two, dress the salad and toss gently. Gallery | This entry was posted in Main Dishes, Salad, Starter and tagged calamari, calamari salad, calamari starter, ginger sesame lime dressing, squid, squid salad. Bookmark the permalink. I love calamari! I cant wait to try this! It looks so refreshing. It is a great salad. Easy, quick and refreshing. I am on a Calamari journey, my first attemt at Calamari and i will surprise my wife on her birthday tomorrow with Oli´s precise and refreshing “easy recipe”. and calamari 1. time for most of the guests. It was a good starter for the marinated salmon and cod. Thank you Oli and Regina. You are quite the guy! Dagrun must have been quite surprised and pleased. So glad that you enjoyed the salad. By the way, loved the use of sesame oil and scallions.